The Life of Pablo, the life of Yeezus. Because the end of days is nigh, Kanye West's massive Madison Square Garden presentation was the pinnacle of New York Fashion Week. 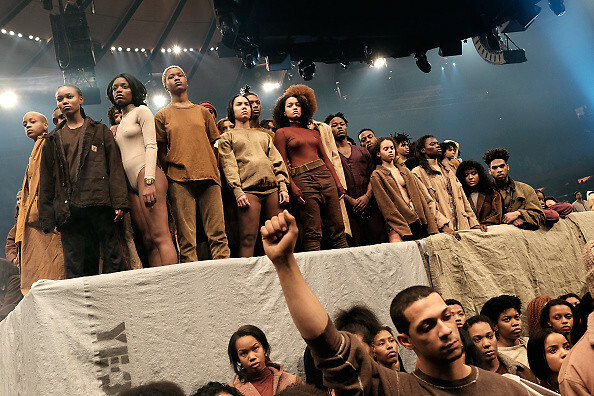 Thousands turned out (many paying big bucks for a ticket) to the Yeezy Season 3 show and album drop, probably expecting a live performance. Essentially though, it was just a spectacle of a listening party. Models wore the typical flesh-colored garments, "looked natural," and DID NOT look at the Jumbotron they were being broadcast on - as the very strict rules instructed. The whole Kardashian/Jenner/West clan was there (save for Rob, of course), a bleach blonde Kim sitting snug next to Anna Wintour. Even Lamar Odom made a rare public appearance. If you weren't one of the lucky ones in attendance (or one of the 20 million online viewers of the live simulcast), click through for everything you need to know.